I can’t seem to stop staring and admiring this build by Cecile Fritzvold for more than a few reasons. 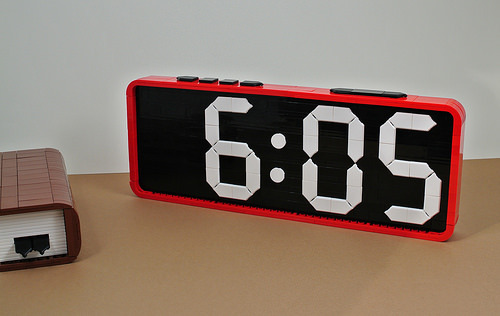 The clean lines and great color contrast make me wish this was a real alarm clock set on LEGO store shelves. Those pentagonal shields which you may recognize from the Nexo Knights series seem like they were made perfectly for this purpose! One thing is for sure, this had not better have a snooze alarm, because it’s only going to end up in pieces every morning. Which may not be such a bad idea after all – snoozing means a rebuild which means you gotta think twice before hitting that button!